Welcome and thank you for taking the time to visit our website. 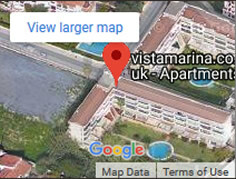 We do hope that very soon, we shall be able to welcome you to 'Vista Marina' for your well earned Benalmadena Costa, Costa del sol vacation. It is a quite complex, in a great location, beach, beautiful Puerto Marina and all amenities close by. Yes we have further photos of the apartment, internal, outside and surrounding area. They can be found here. This is a self-catering, one bedroom apartment, consisting of one double bedroom, a sofa bed in the conservatory, sleeping four people. It is very well equipped with air conditioning, television, DVD, radio, CD, microwave oven, fridge, washing machine etc. We pay particular attention to cleanliness and we are sure you will not be disappointed with the comfortable surroundings. Bed linen is provided. Entering the apartment you have the kitchen on the left, compact but fully equipped. A double bedroom is on the right with fitted wardrobes and bathroom leading off, consisting of shower, toilet and hand basin. Rear Terrace overlooking pool and gardens. The rental price includes electricity and water. The image below shows the apartment block, outdoor pool and sunny garden, it is not overlooked and it's in a great location. 120 meters walk away is the lovely sandy Montemar beach, then La Carihuela beach which stretches along the coast for 2 kilometers towards Torremolinos towards the top of the image. Also just out of view is the famous San Miguel street and plaza. Turn right at the beach and just past the three palm trees and just out of sight is Puerto Marina. The trendy Puerto Marina in the heart of Benalmadena Costa and is only 250 meters away (just out of view to the bottom right corner). The main drag with super market, shops, bars and restaurants are all with in 200 meters. The main bus route can be found at the top of the road or on the corner opposite the Sol House hotel, only 100 meters away. The nearest supermarket is literally up the road. Pubs and restaurants are close by with trendy night clubs at the marina within walking distance and a crawl home!. You don't really need to hire a car if you don't want to. By taxi : a taxi from Malaga airport should be about €15 to €20 euros. By Bus : A bus service at the end of the road - the coastal bus service runs along the coast road which will take you to Fuengirola, Marbella and Puerto Banus plus many other coastal villages en route. There is an excellent circular service running between the village of Arroyo de la Miel and Puerto Marina. The closest railway station for Benalmadena Costa is located in Arroyo de la Miel, close to the Tivoli Theme Park. Trains run from here to Fuengirola, Torremolinos, Malaga, Malaga Airport etc - Train travel is cheap and very efficient. For booking a holiday and to check availability. If you have any questions, do not hesitate to ask contact us.